Happy Birthday to Carson! AND your kayaking trip looked so fun! I have been terrible about commenting. 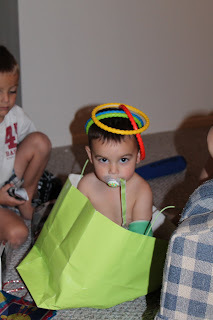 Carson's birthday photos are ADORABLE! It's hard to believe he's already 7! I remember when he was a little toddler in nursery. How cute about his request for a special birthday breakfast! I love how you listed out his favorite things, too! P.S. Happy Birthday + 1, Lindsey! I thought about you yesterday and completely meant to call you. I hope your birthday was WONDERFUL! Miss you and love you!